We can clean and restore most memorials to a high standard, depending on the degree of repair needed we clean them using machinery and various stone cleaning solutions. 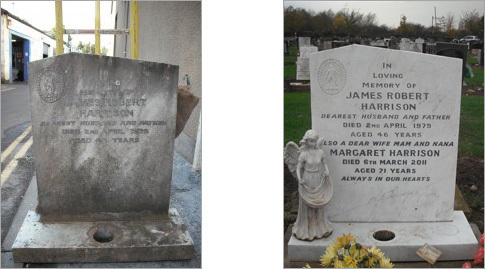 We can also professionally re-letter any stone where the lettering has fallen out on a leaded Memorial or if the lettering has weathered away on very old memorials. The pictures show a white marble headstone before and after, using various methods to reach an excellent finish and as you can see we have also added an inscription to one memorial and repaired weathered to another letters using lead lettering With this type of job we have to first carve or re-carve weathered letters, drill small holes into the carved lettering, and then hammer lead into the letters then we complete the process by rubbing the face of the memorial. This process has been around for many years and has progressed over the years, at first the whole process was done by hand, even the rubbing of the face and at times due to the age or care needed on older memorials we still do all this by hand, but we can use machinery on some. With every service we provide, we will be completely personal to what you want us to do to make sure the headstone is in the best condition for you to use. If you have a headstone that you would like restored to its original condition, we will always take great care and provide the cleaning of every headstone and gravestone in Stockton. 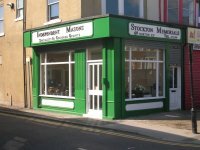 Contact Stockton Memorials today on 01642 673590.